Thoughts on things related to visual comedy. Since 2006, the well known UK comedian Paul Merton has shared his enthusiasm for silent comedy in books and television programmes. I love Merton’s delight for the genre – and he has made it fashionable with a previously skeptical audience. A few years ago, I went to see Paul Merton talk. I was expecting an interesting but academic evening. The evening ticked along calmly until Paul Merton showed a Chaplin short accompanied by live music. It was the proverbial divine revelation! I had never watched a silent comedy with lots of other people before. Despite working in front of large audiences every day – and constantly saying how silent film comedians used all the tricks of vaudeville clowns – I hadn’t given any thought to what it would be like watching a silent comedy film with a large audience. Well, I’m telling you – it was WILD!!! Suddenly these films burst into focus. It was liberating. You could make as much noise as you liked without interrupting the performers or the rest of the audience. The only thing similar to it that I have experienced is pantomime. Which is not surprising as both performance styles stem from the same root. In his recent documentary, “The Birth of Hollywood”, Merton also highlights the “enthusiasm” of early cinema audiences. During my own shows, I often see this “liberating effect” working on individuals in a crowd. Especially on more “cool” people (invariably between 21 and 33) who tend to go through a period of resistance before letting the laughter take them over. Other groups are naturally at ease with the freedom afforded by a wordless show – children have few inhibitions; stressed adults find a great release in “giving in” to the silliness; and old ladies are more than happy to be vocal – I have no idea why! In my series of short films “The Silly Seasons” I hadn’t really considered that the audience might join in in the same way that a live audience might. But having experienced “The Merton Revelation”, I am determined that my next film will be a real joiner-inner – even if I do have to bribe a few old ladies to hide in the audience! We want New Slapstick is a resource for everyone involved in visual comedy of any kind. This week I attended an eccentric dance workshop with Barry and Joan Grantham – authentic music hall performers who have shared a stage with Max Miller. Before I went I googled up a few eccentric dance videos to see what I was in for. “Wow… what the heck is this?” I thought. And not in a good way. When I watch this I am left cold. I don’t really know how to react to it. To me, it’s just plain weird! Things tick along – we learn the famous Laurel and Hardy dance, Wilson Keppel and Betty’s Sand Dance and a very tough Ritz Brothers routine. To me, much of what we’re doing is natural – a silly version of real dancing. But things are put into context by the reaction of the professional dancers and corporeal mime specialists around me. To them, these moves are unfamiliar. In fact, I find that although I can’t do the simple jazz step “shuffle-ball-change”, I can easily execute the eccentric dance moves called “knives and forks” and “cups and saucers”. Suddenly this art form comes into focus. Belying these routines is a core value that is inherent in all good comedy. In the same way that good comedy leads to towards one thing and then wrong foots us to get a surprising laugh, eccentric dance is all about wrong footing our expectations of dance. The weight is wrong, the emphasis is unexpected and rhythms are regularly upset. So for an early twentieth century audience so deeply familiar with dance, eccentric dancing must have been extraordinarily and excitingly misleading. Nowadays, when few of us are familiar with the patterns of dance, the eccentric dancing of yesteryear is meaningless. If you watch the modern version of popular dance such as street dance, you can see the same principles cropping up again. Fans of street dance are thrilled by routines involving offset rhythms and unfamiliar weighting. Isolating body parts are a key part of both eccentric dance and street dance. Moves now known as “popping” and “locking” are present throughout old eccentric dances. So, maybe, even though this form of dancing might seem dated, it is in fact alive and well, reinvented from first principles, in the most of popular dance of out time. To finish, here is Sigune Hamann brilliantly executing a section of the sand dance. Enjoy! Maybe it’s because our idols are from an earlier time. Maybe it’s because we are inherently escapsists. Whatever the reasons, a lot of people involved with live performance love vintage. I was so lucky to be the first clown at Giffords Circus, a beautifully styled, old fashioned, travelling circus. The gorgeous costumes and hand painted waggons are as much a part of the show as the spectacular acts. Similarly, the burlesque scene in the UK is increasingly defined by its retro costumes. And there is hardly a clown in the western world whose outfit is not, at least partly, a tribute to costumes of yesteryear. But is there more to it than just love of vintage fashion, or just a desire to recreate our favourite images of theatre and performance? For me, there is something very specific about the things that we appropriate from the past. It is partly the luxuriant textures of wood, velvet and heavy cloth – as opposed to plastic, polyester and plastic. But more importantly, many of these vintage items come from a time before the efficient homogeneity of mass production – they are imperfect – and for visual comedy, there is nothing better than something that is imperfect! To create some good, simple gags, choose a scenario and then find props for that situation which don’t quite work properly. It won’t take too much exploration and repetition to create some good fun. One of my favourite routines is trying to pick up some old trestle table legs. The trestle legs are a perfect example of an imperfect prop from a bygone age. They have been quickly knocked up in a shed, they have not been designed to be perfect, they have not been designed to high safety standards(!) and they are unique and unpredictable. I also do this gag with modern folding chairs, but it’s just not the same: the hinges operate smoothly, they don’t make a funny clacking noise and, frankly, they work properly. On one level I love vintage for the timelessness that it allows – an audience can imagine a world undefined by the context of occurring on a specific date. On another level, I love the luxurious materials. And finally and most importantly, it is filled with imperfection, which for a visual comedian, who is looking for things to go wrong, is… perfection! Is vintage is just about clinging too hard to our influences? Or does vintage style add something to a performance? Or is it about something else? We want New Slapstick as a resource for everyone involved in visual comedy of any kind. 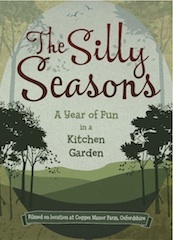 Click here to watch the trailer for the new Silly Seasons films!